Home » Blogs » cividesk's blog » What is the difference between DO NOT EMAIL and USER OPT OUT? What is the difference between DO NOT EMAIL and USER OPT OUT? If a contact does not wish to receive any emails, whether they are transactional or mass emails from your organization, you can select this option in their contact record under the Communication preferences section of the Summary page. Click on "Edit Communication Preferences" and select "Do not email" in the privacy section. When mass emails are sent, there is always an option to "OPT OUT" from all the mass emails sent out by your organization by clicking on the "Unsubscribe" link in the footer of the emailing. 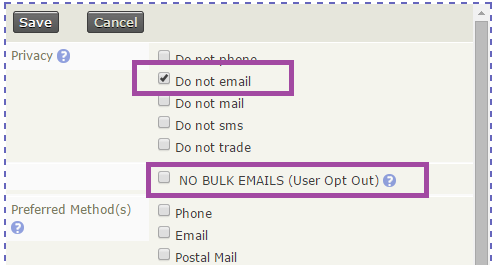 If the contact decides to do this, the box marked NO BULK EMAILS (User Opt Out), will be automatically checked.